Traveling through airports usually comes with plenty of challenges these days. Even more so when you need to eat gluten-free. Have you ever looked around an airport and been faced with a plethora of fast food joints and prepackaged food stands and coffee shops serving only pastries? Have you ever faced all of that and not found a single place you can eat safely? I can't count the number of times my heart (and stomach) sank in airports when I couldn't find anywhere to get safe food. Whenever I travel, I try to research the airports that I will be traveling through, and I try to find a safe eatery ahead of time. I pull up restaurant websites. I print out menus. I plan and anticipate. And sometimes I just get lucky. I was thrilled to find that there was a full service restaurant somewhere in the Baltimore-Washington International Airport that served gluten-free meals! 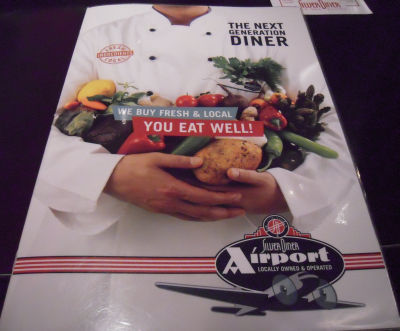 The Silver Diner has several locations in Maryland, but the most important one for me is their location in the BWI airport, behind security on Concourse B. This diner is far above what I usually think of when someone says "diner". This is not what's left over from an old, rundown diner. This is a new, retro diner, with a modern menu. 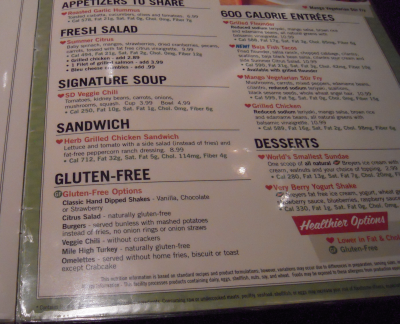 I was impressed that the gluten-free items were right on the regular menu. And then I was pleasantly surprised that the prices were rather reasonable for a sitdown restaurant inside the airport. I was expecting much higher prices. We were getting on an evening flight, so I decided that I needed dinner. Dinner, for me, must include a vegetable, preferably green. So, I decided on a side salad, the citrus salad to be specific. 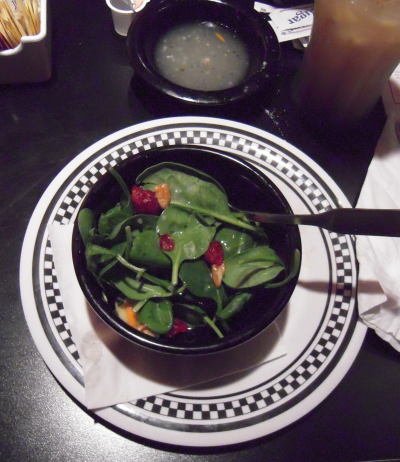 It was a baby spinach salad with dried cranberries, orange, pecans, and citrus dressing. I wasn't sure I was going to like it, but ordered anyways, since it was gluten-free and green. I was pleasantly surprised with the quality and freshness of that citrus salad. All of the spinach was very fresh and very small. No large leaves here. And the dressing was very limey and nice. For my main course, I ordered a mushroom and cheese omelette. 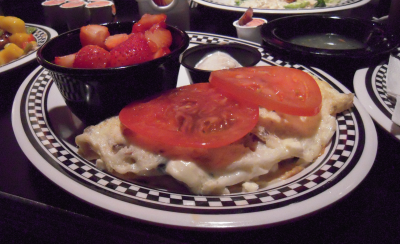 I loved that they served my breakfast dinner with slices of fresh tomato on top! Who said you couldn't have breakfast for dinner? Certainly no one in this family! The everything in my omelette was just as fresh as that citrus salad. On the side, they gave me fresh strawberries that were simply beautiful and sweet. I don't know what greenhouse they found those in, but they were fantastic! Everything was amazingly fresh. Everyone was very happy with what they received. I can highly recommend the Silver Dinner in the BWI airport, for both gluten and gluten-free eaters. We have even discussed finding the Silver Diner's other locations in our area. Our server assured us that their stand-alone restaurants have even more gluten-free options on their menus! I already love this place!